Click the logo for Gunnison Country's website! 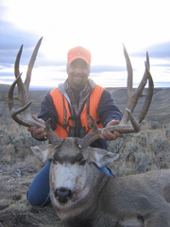 Gunnison Country Guide Service has been offering fully guided deer, elk, bighorn sheep, and mountain goat hunts in the Gunnison Basin area of west central Colorado for over 30 years. In this time, this Colorado Outfitter and Guide has established an exceptional track record of success. As a deer guide and an elk guide, their clients routinely enjoy a success rate that is well above average. This success is not only in the total harvest, but with the trophy animals taken as well. Operating with in the famous Gunnison Basin on deer and elk unit 55, the potential of a true trophy buck is better than most any other area in the west. Their elk hunters also enjoy success that is much better than average. Trophy deer and elk are not their only claim to fame. 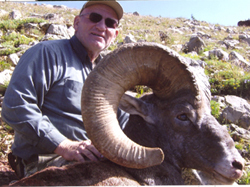 Gunnison Country Guide Service are also exceptional bighorn sheep guides and mountain goat guides. Utilizing horses and mules to access the high country that these two species call home makes for a fun and exciting hunt. Having to hike into this high country can end a hunt for many hunters before they even get started. Gunnison Country Guide Service operates deep within a wilderness area on sheep units 11, 17 and 26 and mountain goat units 3, 8, 9, and 13. Just being able to access this country is a big part of the challenge these two animals present and the use of horses and mules make this much easier. This will leave the hunter much better prepared for the hunt it?s self. Check out their website at Gunnison Country Guide Service or contact Hunters Trailhead for more details.